Botanical Name: Trifolium repens L.
Other names: Dutch clover, honeysuckle clover, white trefoil, purple wort. White clover is found throughout most of North America. White clover is a perennial broadleaf weed which flowers throughout the summer. It spreads by seed, and by low creeping branched stems which root at the nodes. White clover can be a weed of turf, landscapes, orchards, and nursery crops. It can grow in a variety of soil types and pH ranges. White clover forms low mats with creeping branched stems that root at the nodes. The stems are smooth. The leaves are trifoliate with a pale triangular mark on each leaflet. The flower heads consist of an aggregate of individual flowers which form rounded white heads at the end of long flower stalks that arise from the leaf axis. These flowers may be pinkish, eventually turning brown when fruiting begins. The fruiting pods form seeds which are about 0.04 in. long, yellow or brown, and kidney shaped. The seeds germinate under cool moist conditions in the spring, early summer or fall. White clover tolerates low mowing well. It will not persist in extremely dry areas. 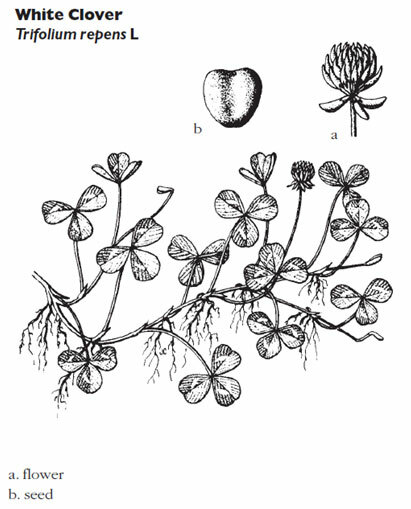 White clover belongs to the legume family and fixes nitrogen when the correct species of Rhizobium bacteria is present on its roots. Its dense creeping habit enables it to compete well against other broadleaf weeds. Its flowers are attractive to bees, therefore white clover may pose a hazard for people sensitive to bee stings. White clover can be difficult to manage culturally as it easily co-exists with turfgrass and spreads rapidly by creeping stolons. White clover can be controlled chemically with several broadleaf herbicides in the spring or fall. Consult the herbicide label for specific instructions. The turfgrass area should not be mowed for two to three days before and after herbicide application. The treatment application should be done at a time when there is no rainfall expected for at least 12 hours. For a details on current herbicides registered for white clover, refer to the latest edition of the Professional Guide for IPM in Turf for Massachusetts.